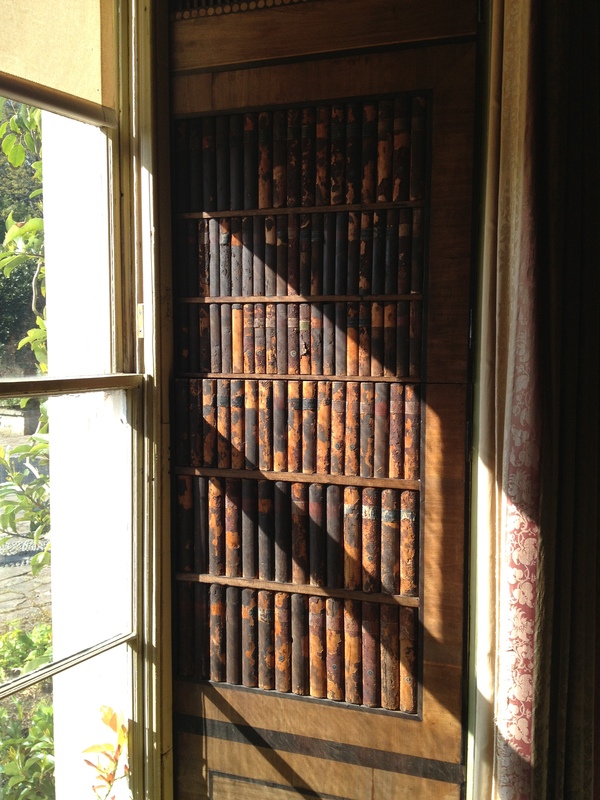 A window shutter in the library of Mount Stewart, County Down. This is located in what is now the west wing, the section designed by English architect George Dance the younger c.1804. 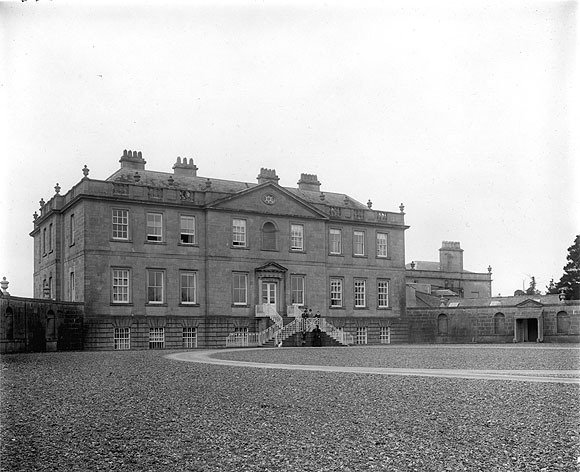 Dance had visited the house in 1795 when he came to Ireland with his supposed lover Lady Elizabeth Pratt, sister of the new Lord Lieutenant Lord Camden. She was also sister-in-law of Mount Stewart’s then-owner Robert Stewart, first Baron Londonderry (later first Marquess of Londonderry) who early in the new century decided to enlarge his property and called upon Dance’s services. However, we know the architect did not come to Ireland again until 1815, instead sending drawings from London which were executed by John Ferguson, the estate carpenter. Note how the shutter’s prosaic function is concealed by being lined with leather bindings in imitation of those books filling the surrounding library shelves, a deft touch on the part of either Dance or Ferguson. 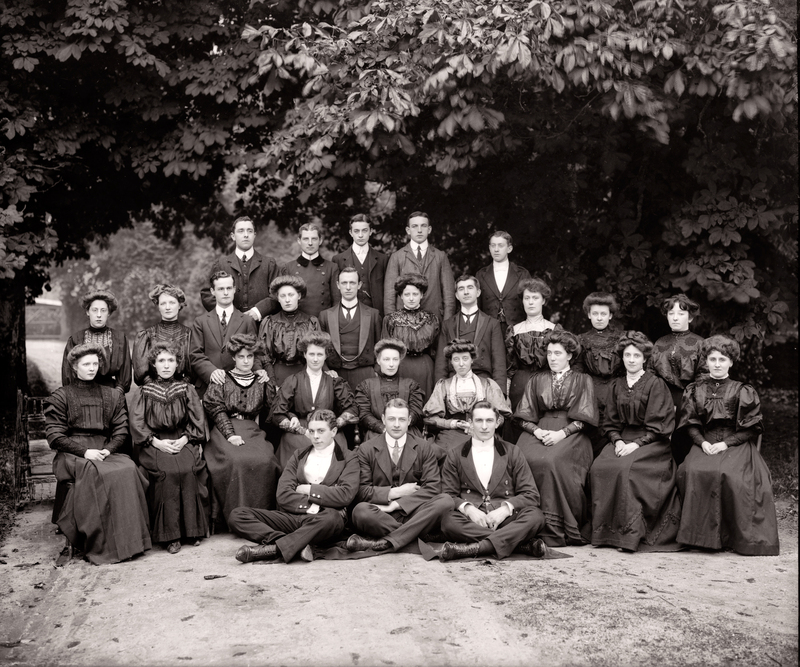 Believed to date from September 1908 this photograph, which has appeared on several sites of late, shows the indoor servants at Bessborough, County Kilkenny. The house lay at the centre of an estate owned by the Ponsonby family. The first of their number to settle in Ireland was yet another of those English soldier adventurers who came to this country in such abundance during the late 16th and 17th centuries. Originally from Cumberland, Colonel Sir John Ponsonby was a member of Oliver Cromwell’s army who found himself rewarded for military service here with a parcel of land. 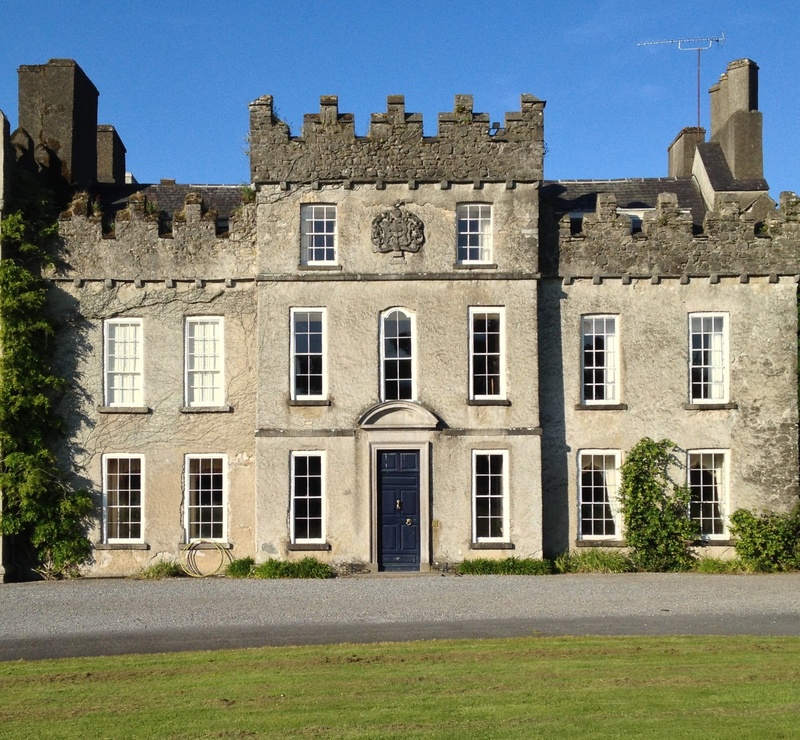 He subsequently acquired several more, the largest being an estate by the river Suir in the south of the county hitherto owned by the Anglo-Norman D’Altons after whom it was called Kildalton. Here he settled and having built himself a residence, he re-named the place Bessie-Borough, later Bessborough after his second wife Elizabeth Folliott. Subsequent generations increased their landholdings in both Kilkenny and the neighbouring counties of Carlow and Kildare and by the mid-18th century were in possession of almost 30,000 acres. Furthermore, following the example of Sir John who had served as a local MP in the Irish Parliament and especially in the aftermath of the Williamite Wars (in which the Ponsonbys had been decisively opposed to the Roman Catholic James II) they became more engaged in politics. 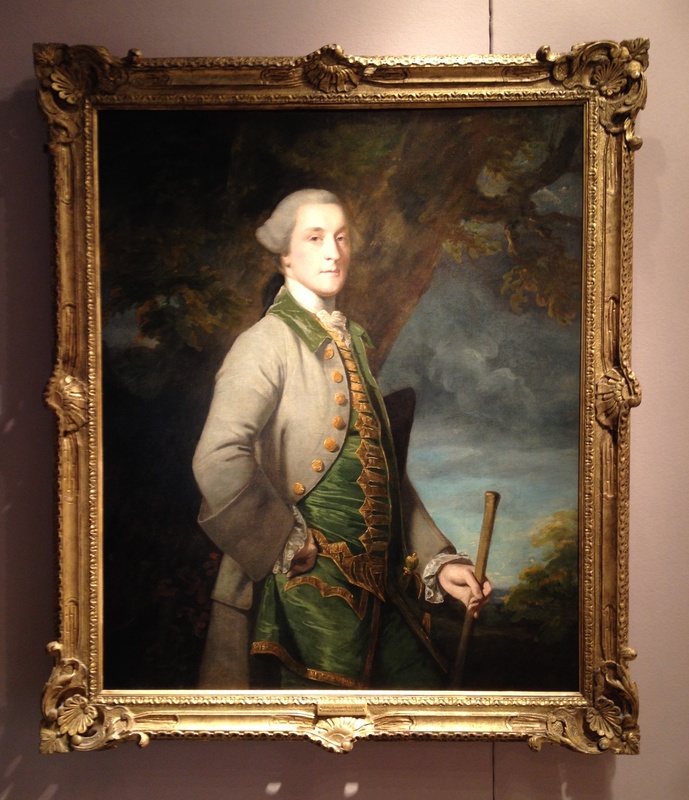 William Ponsonby, third son of Sir John, was created Baron Bessborough in 1721 and Viscount Duncannon two years later; in turn his son Brabazon Ponsonby became first Earl of Bessborough in 1739. Likewise in an essay on Bindon published in the Irish Georgian Society Bulletin for spring 1967, the Knight of Glin, evidently struggling to find something good to say about Bessborough (he described the garden front as being ‘an uninspiring six-bay breakfront composition with a pair of Venetian windows clumsily adrift on the first floor’) commented ‘The redeeming architectural feature of the house is to be found in the fine handling of the shallow quadrants leading to the flanking pavilions…The facing sides of the pavilions have niches and surmounting lunettes.’ The photographs above show the front of the house before and after it was altered at the end of the 19th century when the double-staircase leading to the raised entrance was removed and the ground was lowered to permit access via a porte-cochere; this work was undertaken by architect Sir Thomas Manly Deane. 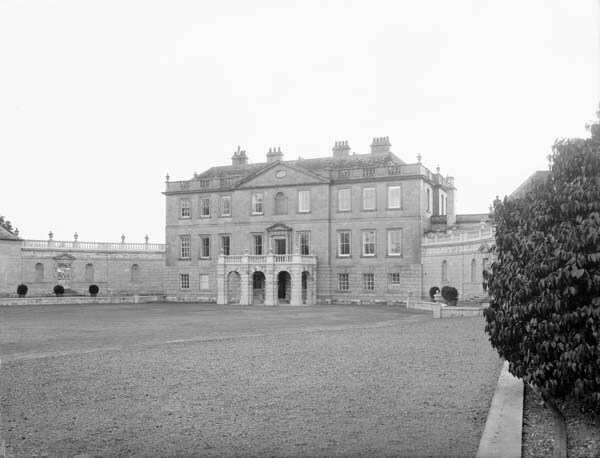 His proposals were never carried out, not least because another fifteen years were to pass before Henrietta, Lady Bessborough – the beautiful sister of Georgiana, Duchess of Devonshire – came to see her husband’s Irish home, although she was equally delighted with it then, writing ‘I like this place extremely; with a very little expense it might be made magnificent, and it is beautiful…’ Likewise when staying in the house in September 1828 with the next generation of Ponsonbys, that indefatigable diarist and letter-writer Thomas Creevey advised his step-daughter Elizabeth Ord, ‘This is a charming place. I ought to say, as to its position and surrounding scenery – magnificent.’ Above are two photographs of the garden front of the rear. Note the two-storey extension to the left of the main block, which may date from the same time as the alterations to the front. However, as the second picture shows, at the very start of the last century, this development was improved by the addition of a balustrade stone terrace with double steps leading down to the garden. 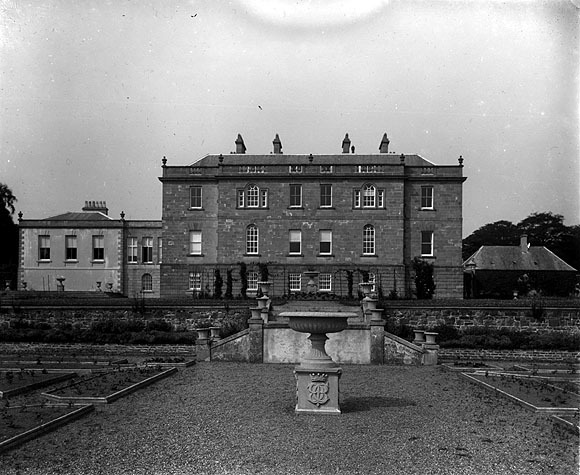 We have relatively little information about the interiors of Bessborough, although they were, as both the largely absentee third countess and Thomas Creevey duly noted, certainly magnificent. The entrance hall – which became a sitting room after Deane’s alterations – featured a screen of four Ionic columns of solid Kilkenny marble each ten and a half feet tall. Sadleir and Dickinson’s 1915 Georgian Mansions in Ireland includes a couple of photographs of the saloon or drawing room, both shown above. 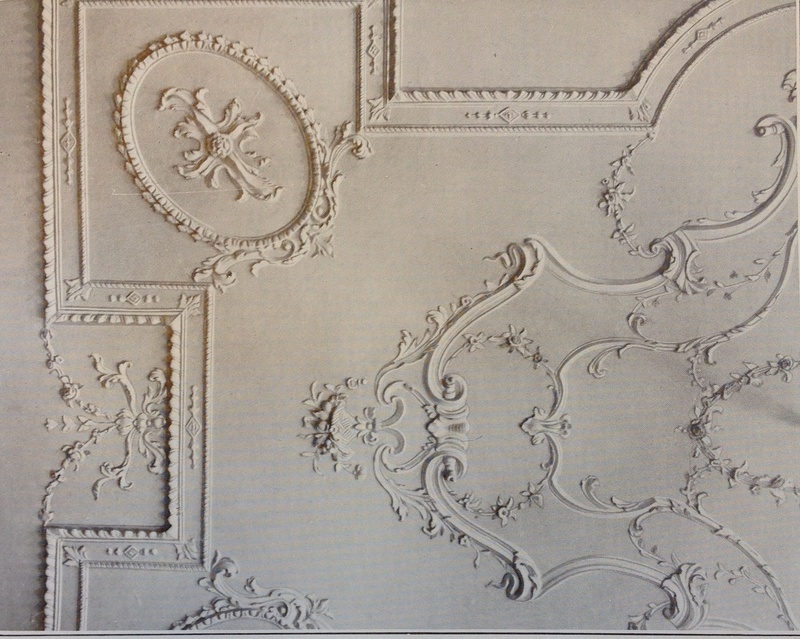 One features a detail of the splendid rococo plasterwork with which the ceiling was decorated. The other shows the chimney piece, a design supposedly taken from William Kent although Sadleir and Dickinson propose the female herms in profile are portraits of the second earl’s two daughters, the Ladies Catherine and Charlotte Ponsonby who married the fifth Duke of St Albans and the fourth Earl Fitzwilliam respectively. There remains a great deal more to tell about Bessborough, its destruction, reconstruction and subsequent history, so rather in the manner of Country Life, today’s piece finishes with the words: To be concluded next week. 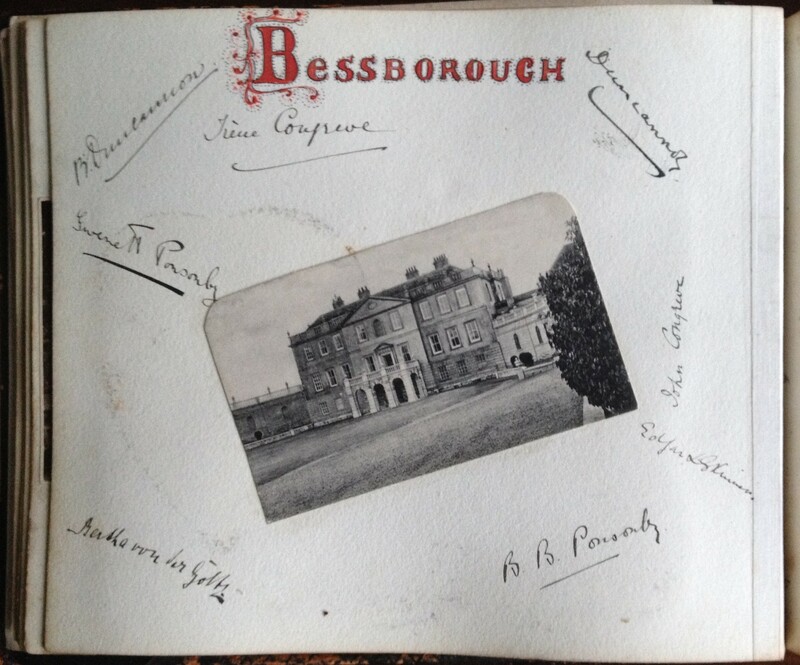 Meanwhile, below is a photograph of Bessborough with surrounding signatures of members of a house party there, taken from a visiting book kept by one of the Mulholland family (of Ballywalter, County Down) at the start of the last century. 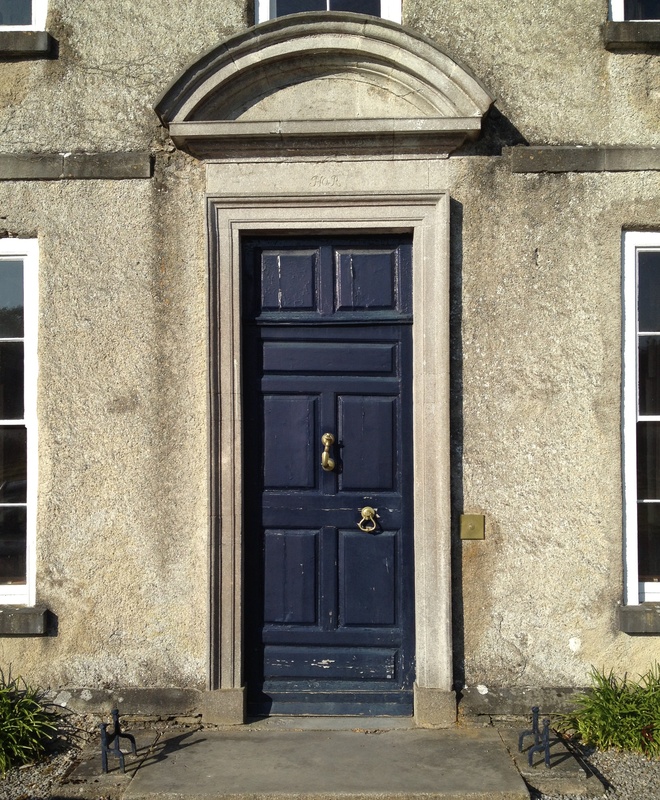 The early 18th century entrance to Ballinlough Castle, County Westmeath, an exceptionally tall and narrow door with segmental pediment above, added one suspects to indicate the owners were aware of classical architecture. Incorporating an older structure, this section of the castle is of two storeys and of a seven-bays, the three advanced centre bays rising to an attic which features the family coat of arms (dated 1617 and presumably therefore taken from its predecessor). Like the door, the windows are taller than usual, that on the floor immediately above the door having a round top. A late 18th century extension to the immediate left of the photograph below will be discussed at a later date. 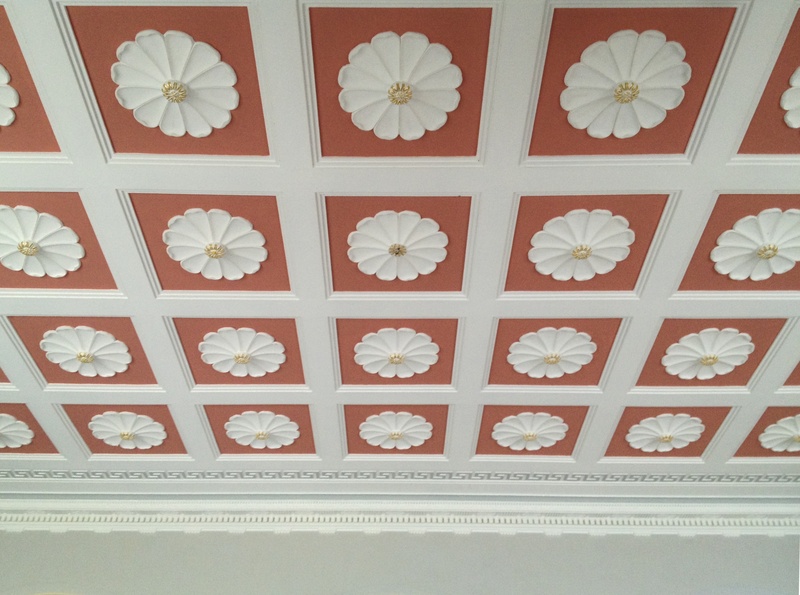 Two of the ceilings in Townley Hall, County Louth, that of the drawing room (above) and the entrance hall (below). Dating from the late 1790s Townley has been discussed here before, not least its rotunda stairhall (see Là, tout n’est qu’ordre et beauté, June 10th) but amply repays further visits. The neo-classical masterpiece of Francis Johnston, the house owes as much to the couple responsible for its commissioning – Blayney Townley and Lady Florence Balfour – as to the architect. 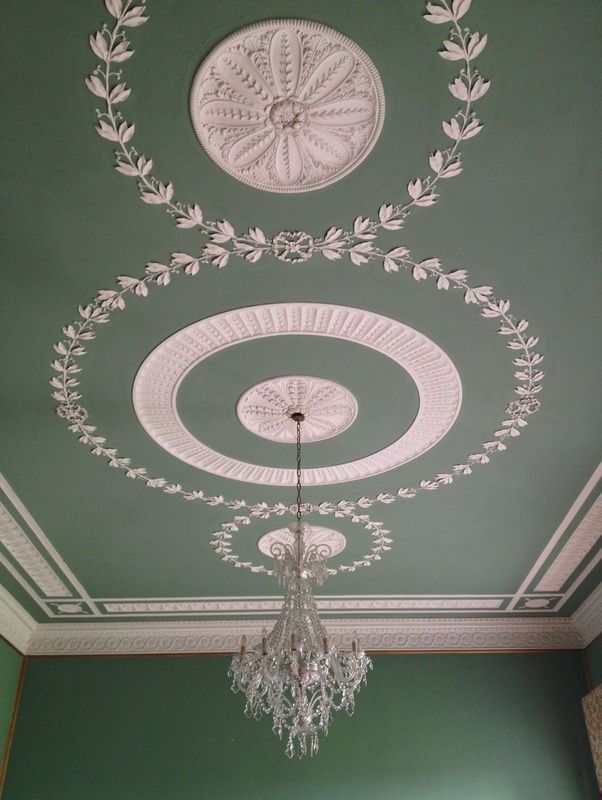 As these photographs show, the purity of decoration throughout is flawless. Passing through the village of Kilconnell, County Galway one sees an extensive range of ruins to the immediate west of the main street. 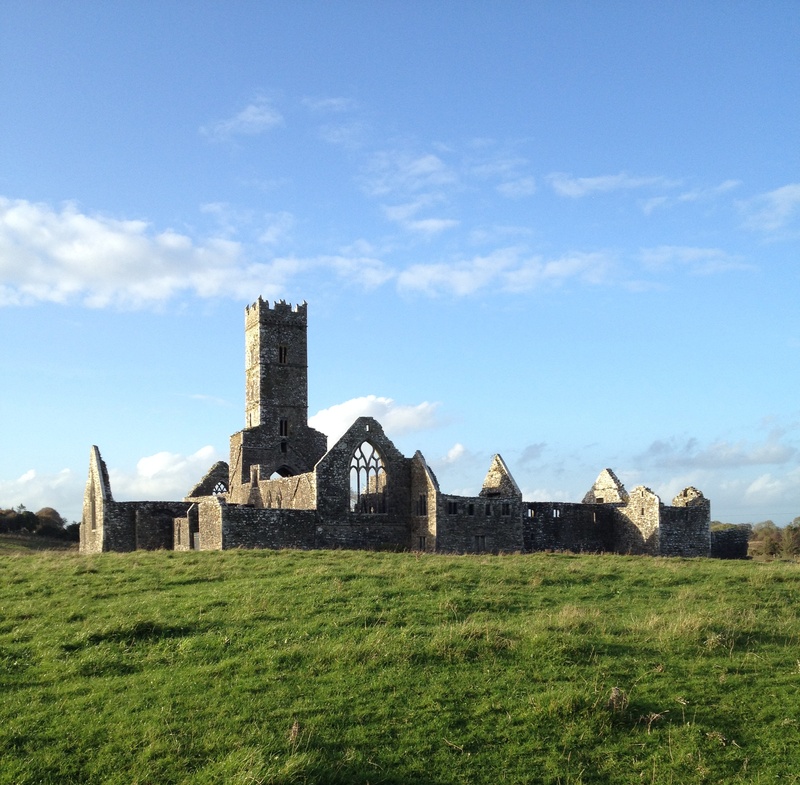 Here in a field grazed by sheep who look blithely impervious to the architectural glories around them stand the remains of a former Franciscan friary. 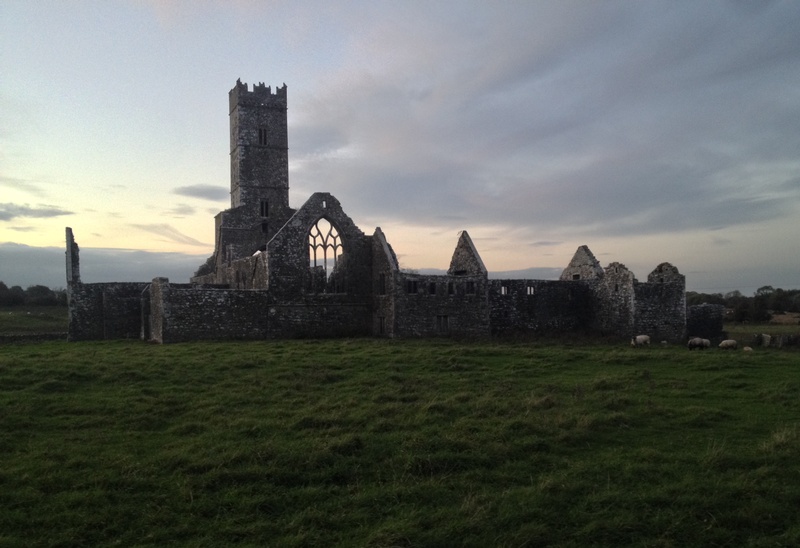 There has been some discussion about the precise date of the building’s foundation, perhaps because it is proposed to be on the site of an earlier religious settlement established in the sixth century by St Conal, or Conall (of whom there seems to have been more than one). Hence the Irish placename Cil Chonaill, meaning Conall’s church. In any case, if monks did live here before the Franciscans arrived no evidence of their presence remains. 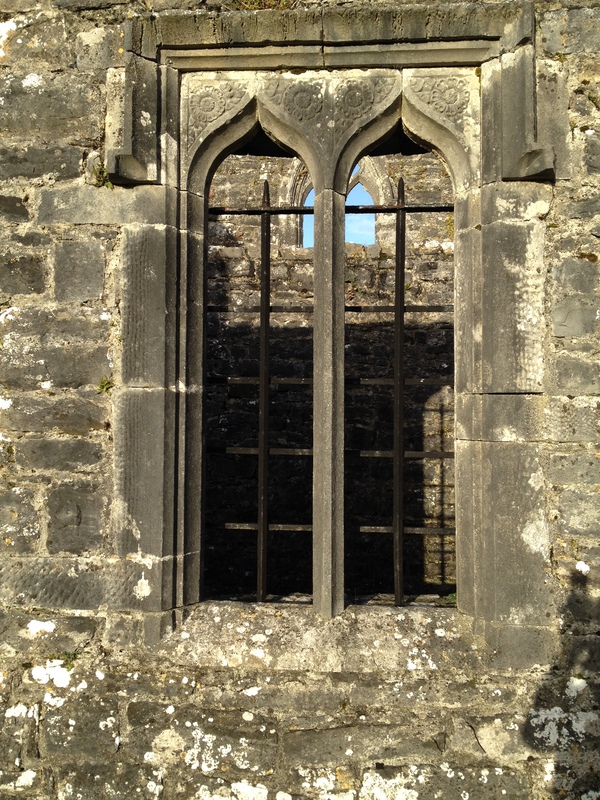 It is most commonly suggested the friars established their house around 1414 at the request of and with assistance from William O’Kelly, Lord of Uí Maine – one of the oldest and largest kingdoms in Connacht that included much of this part of the country – who died in 1420. 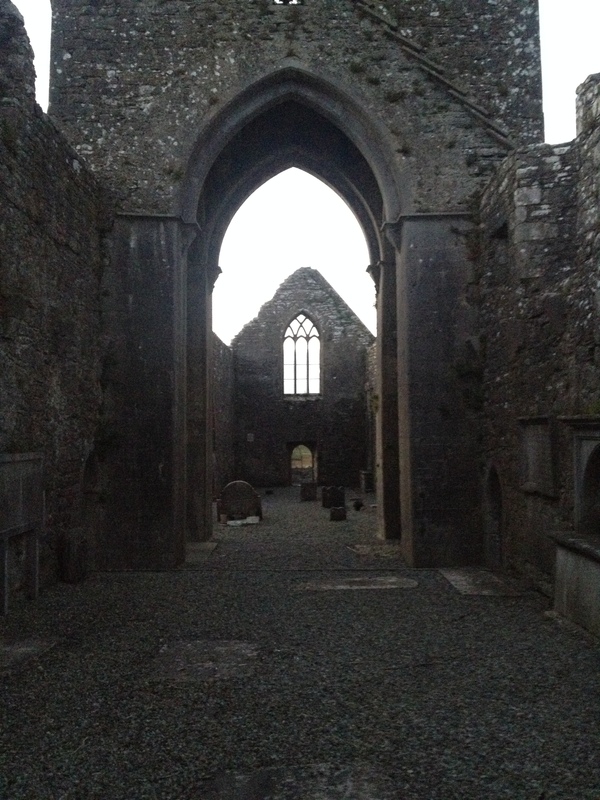 Kilconnell Friary is more elaborate than most such Franciscan establishments. The original body of the church consisted, as was always the case with this religious order, of a single long nave continuing into a choir of similar proportions. A cloister to the immediate north of the church then ran east to a two-storey domestic range that held offices below and a dormitory above. Only the east and part of the south range of the cloister arcades survive but these are notable for the variety of stonemason’s marks carved into them. Later in the 15th century, and rather unusually, a large square tower was erected at the central point and running the full width of the church; it still rises three storeys higher than the former roof line and can be sighted across the surrounding countryside. It has very handsome vaulting the piers beneath which sport a couple of delicate carvings of an angel and an owl. Around the same period a south aisle was joined to the nave by an arcade as well as a south transept accessible from both nave and choir, with a small chapel added to the immediate east in the 16th century. These adjuncts make Kilconnell larger and finer than the majority of its sister houses in Ireland. 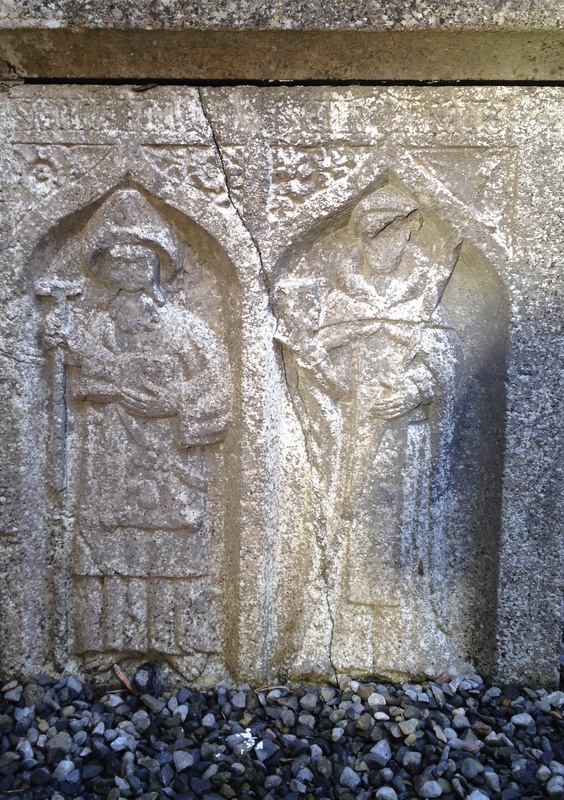 What further distinguishes Kilconnell Friary from other such churches is its exceptionally impressive collection of niche tombs found lining the walls of both nave and choir. The former holds the most elaborate of all, located just inside the west entrance on the north wall. 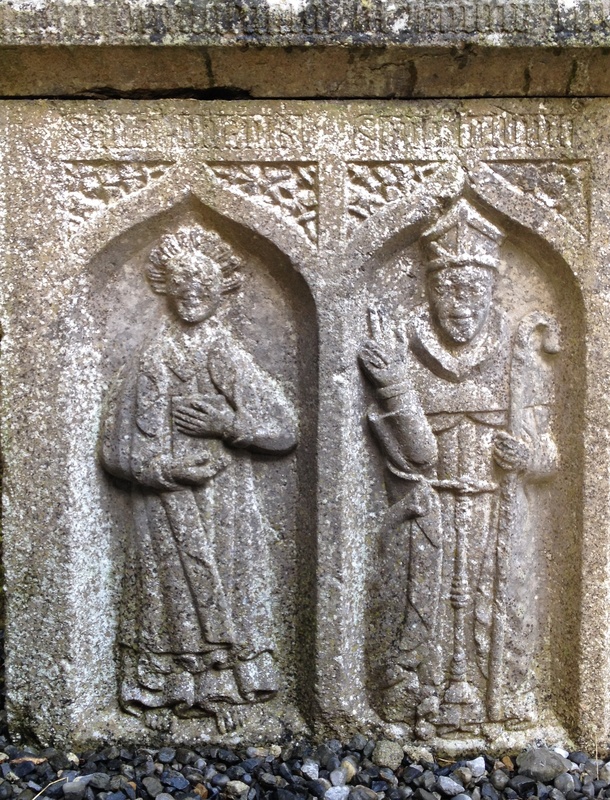 The upper section is dominated by an ogee canopy with flamboyant stone tracery and capped by a carved panel containing two figures widely believed to represent St Patrick and St Francis. The base of this monument is given over to a long slab featuring six further figures, each identified by name: St John the Evangelist, St Louis of Toulouse, the Virgin, St John the Baptist, St James Major and St Denis of Paris. 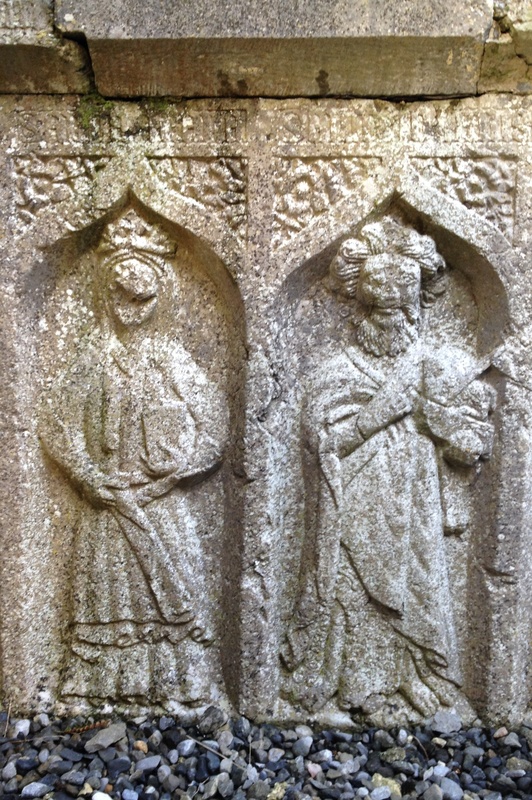 There has been some speculation why two French saints should appear on this tomb, but perhaps the explanation lies with the family responsible for its erection; unfortunately it is unknown who that might have been. 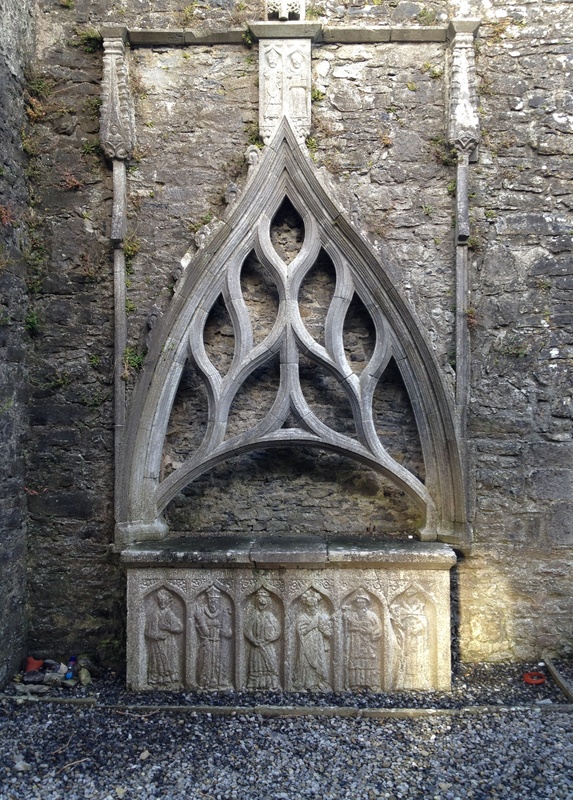 Another similarly flamboyant gothic tomb, albeit without the carved figures, can be found on the north wall of the choir, this one associated with the O’Daly family and another on the opposite side is an O’Kelly tomb of marginally less splendour. The main windows are also particularly good, including those in the south aisle and transept but best of all, and probably latest, is that on the west wall. 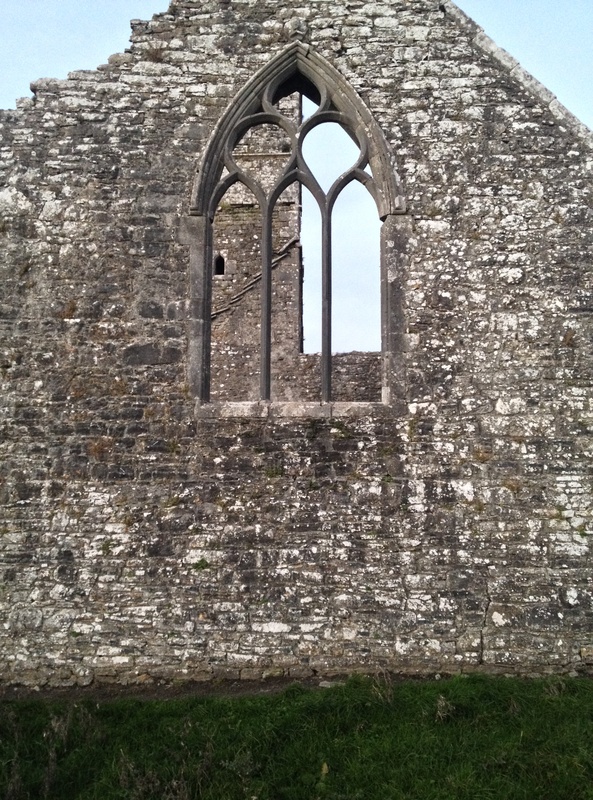 Kilconnell Friary’s prominence, apparent in its size and decoration, remained long after other religious establishments were closed as part of the Dissolution of the Monasteries in the 1540s. Although occupied by English troops in 1596, twenty-one years later it was claimed that the buildings were intact and still in use, with a community of six friars. 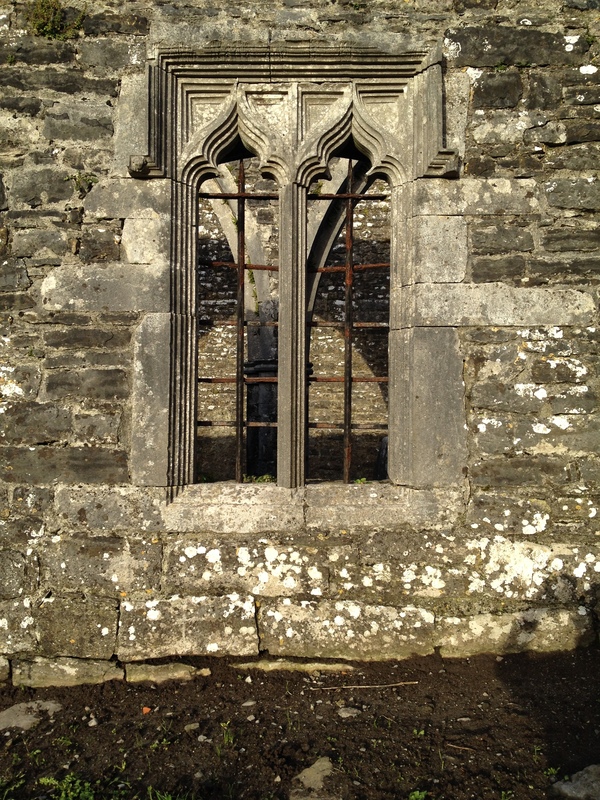 Their lands were granted by James I to the Norfolk-born judge Charles Calthorpe in 1616 and in 1667 Matthias Barnewall, 8th Baron Trimlestown, who on Oliver Cromwell’s orders had been transplanted to Connacht from his family estate in County Meath was interred inside the friary, as commemorated by an armorial tablet set into the wall of the former sacristy. There were still friars on the site in 1709 and a few remained until 1766. Seemingly the last one, who had been acting as a parish priest, only left in 1801. Long before that date, however, the buildings had become ruinous: an engraving included in Francis Grose’s Antiquities of Ireland published in 1791 shows the church roofless, its walls already half-smothered in foliage (in fact the image suggests the structure was in poorer condition then than is the case today). In his Tour of Connaught (1839) the Rev. Caesar Otway wrote ‘The shell of the abbey is as picturesque as can be, where there are neither hills, rock, lake nor river, and but a few distant trees to improve the scenery; perhaps its ivy-mantled tower and time-tinted roofless gables, with all their salient angles, producing the happiest effects of light and shadow, are better in keeping with the waste and desolation that preside over the place, destitute as it is of any modern improvement or decoration whatsoever.’ So it remains to this day, a monument to the glories of late-mediaeval Ireland still unadorned by modern improvements and still mostly frequented only by a flock of disinterested sheep. 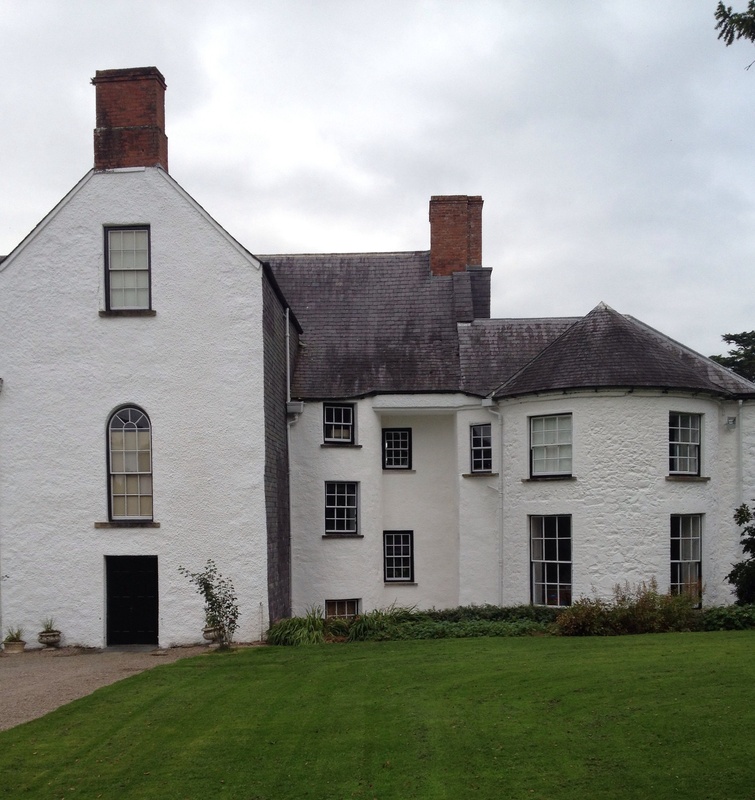 Springhill, County Derry, a rare example of a 17th century Ulster plantation house, unfortified although it was originally surrounded by a defensive bawn wall. Springhill was built c.1680 for William Conyngham following his marriage to Ann Upton that year when he was required to build for the bride ‘a convenient house of lime and stone, two stories high … with necessary office houses.’ The two single-storey wings were added around 1765 when the facade was also modified to its current seven-bay appearance. 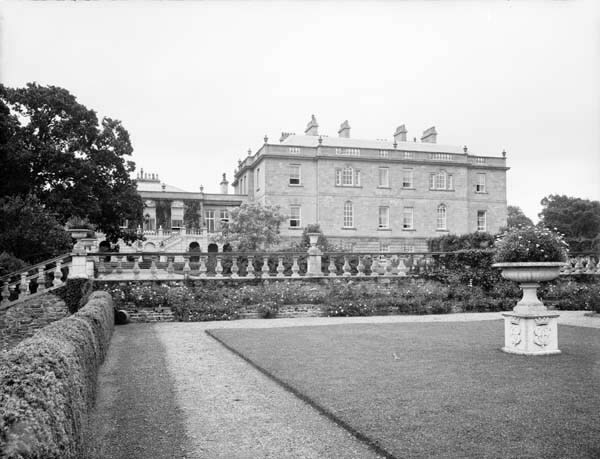 Springhill remained in the Conyngham (later Lenox-Conyngham) family until 1957 when it was given to the National Trust. The orderly and symmetrical entrance front contrasts with the building’s irregular rear (note how one wall is faced in slate) the style of which hints at the Conyngham’s Scottish origins. 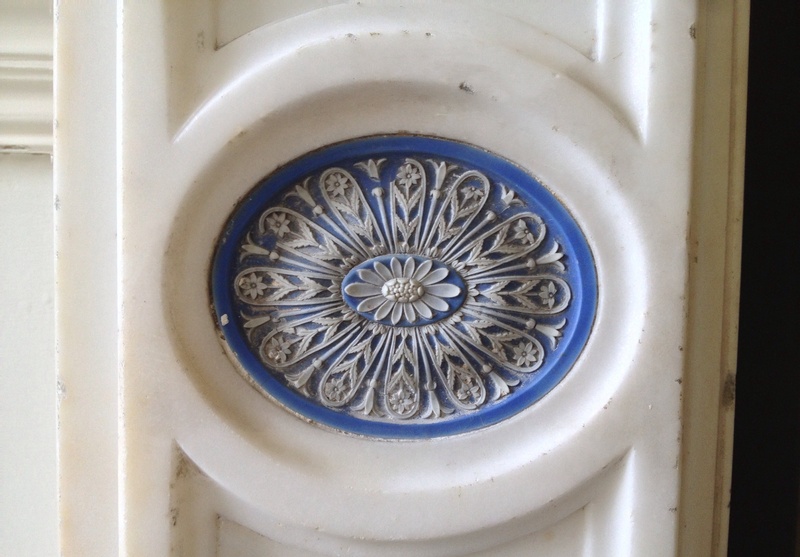 A blue and white Wedgwood jasper ware disc inserted into a marble chimneypiece on the first floor rear drawing room of 45 Merrion Square, Dublin now the offices of the Irish Architectural Archive. This hard stoneware pottery developed by Josiah Wedgwood in 1775 was soon used not for making cups or vases but to produce such items as plaques and discs which could be used in the decoration of rooms. 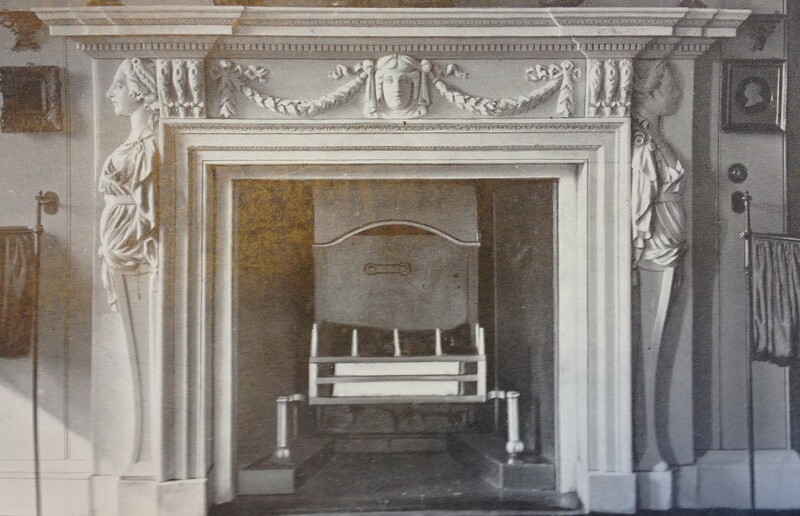 So it is in two rooms at 45 Merrion Square where the plain white of the chimneypiece is relieved by bursts of vivid colour. It is said that above his drawing board, the great French landscape architect André Le Nôtre hung a sign on which was written ‘To improve nature and reveal true beauty, at the lowest possible cost.’ Today we would consider the Le Nôtre style of gardening so to interfere with nature that its true beauty is impossible to discern and at very considerable cost: the jardin à la française, exemplified by those created by Le Nôtre for Louis XIV at Versailles, is a thing of wondrous artifice. While the taste for such gardens reigned across Europe for at least a century, as always a reaction against them emerged, inspired at least in part by philosophical speculation on the character of man’s interaction with nature. Thus in 1757, Edmund Burke published his treatise on aesthetics, A Philosophical Enquiry into the Origin of Our Ideas of the Sublime and Beautiful which sought to explain our emotional and aesthetic responses to natural phenomenon such as mountain ranges. As proposed by Burke and his followers the sublime induces extreme passion, most notably terror. 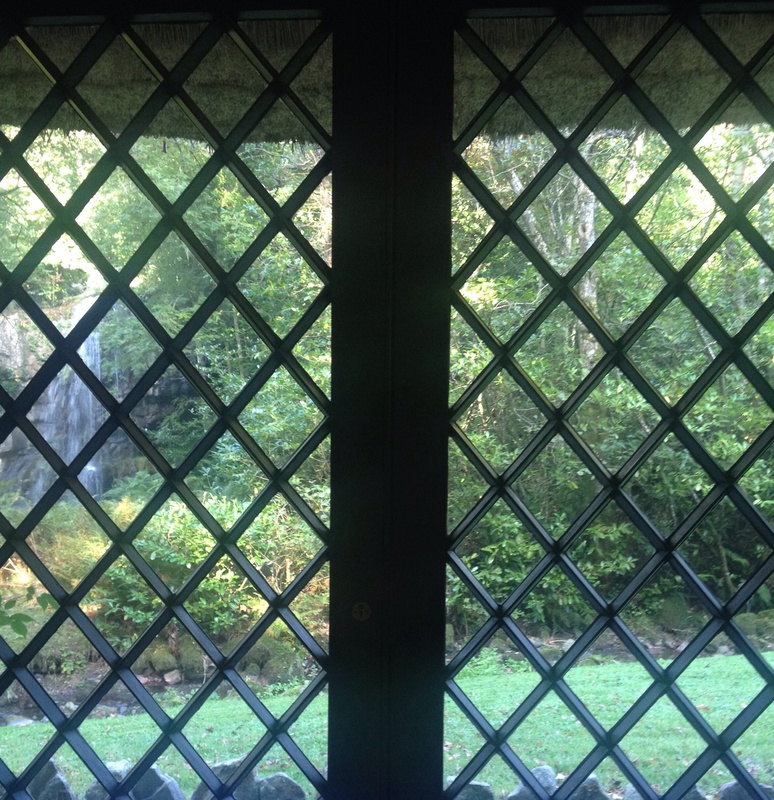 This differs from the simultaneously powerful but gentler feelings induced by another aesthetic experience which was first analysed in the 18th century and would have a profound effect on taste in gardening: that of the picturesque. As the word implies, the picturesque is associated with painting (it derives from the Italian term ‘pittoresco’ meaning ‘in the manner of a painter’). It was thus used by a key figure in the evolution of the concept William Gilpin who in his 1768 Essay on Prints defined picturesque as being ‘expressive of that peculiar kind of beauty, which is agreeable in a picture.’ Essentially the picturesque as proposed by Gilpin and others offers an aesthetic experience between the extremes of the sublime (which induces an emotion akin to terror) and the beautiful which relies on symmetry and a calm-inducing order. The inspiration for landscapes that might be classified as picturesque came from artists of the previous century, most notably Claude Lorrain and Gaspard Poussin. 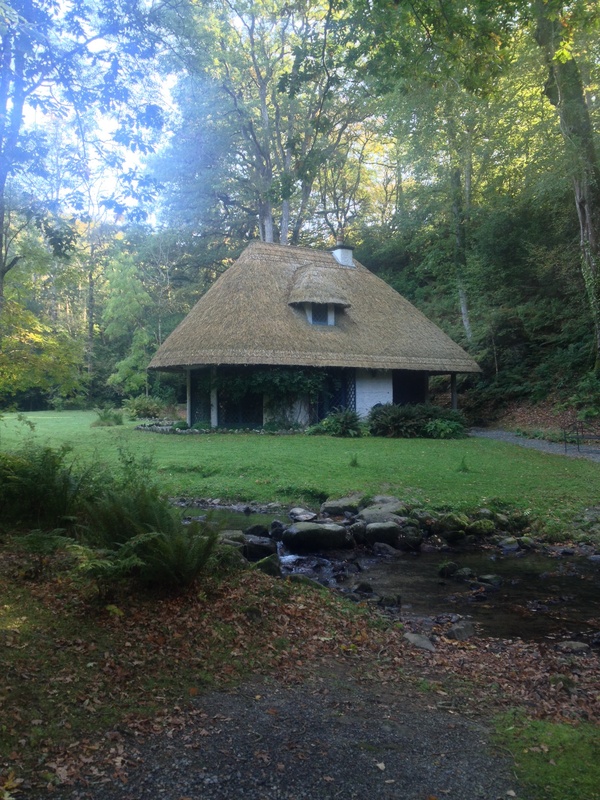 In Ireland one of the most perfect expressions of this kind of landscape design can be found at Kilfane, County Kilkenny where theories of the picturesque were put into practice with enchanting results. 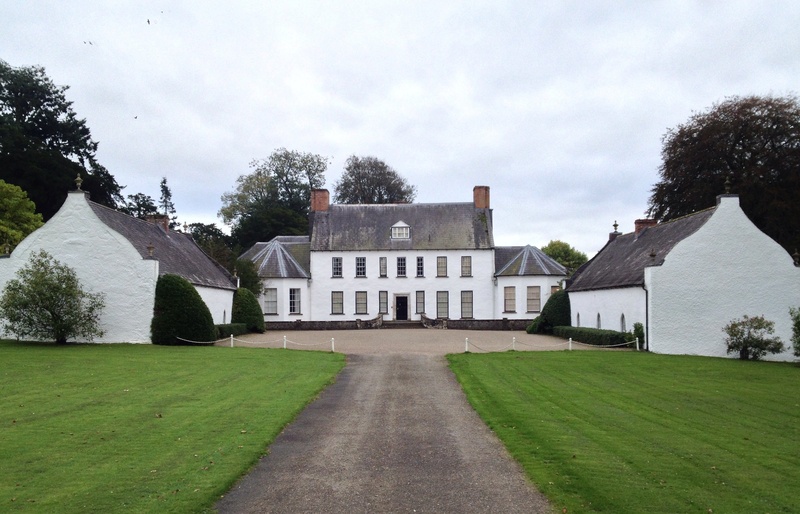 The Cantwells were Lords of Kilfane until the 17th century when they were banished to Connaught. Then their lands passed into the hands of Colonel John Bushe who was granted Kilfane in 1670 and whose descendants remained there for the following century. In the late 1700s, a certain John Power came to live in the country at Ballynahinch and soon after married Harriet Bushe whose brother Henry Amias Bushe then lived at Kilfane. Eventually John Power took a lease in perpetuity on the property from his brother-in-law, and carried out many improvements on the estate, as we shall see. The Club House was also much frequented by participants and supporters of the amateur theatricals organised by members of local families, not least Captain Power’s brother Richard who was an ardent thespian. So ardent indeed that he was the driving force behind the founding in 1802 of a theatre in Kilkenny called The Athenaeum which thereafter hosted annual seasons of plays until 1819, in all of which Richard Power took a leading role. 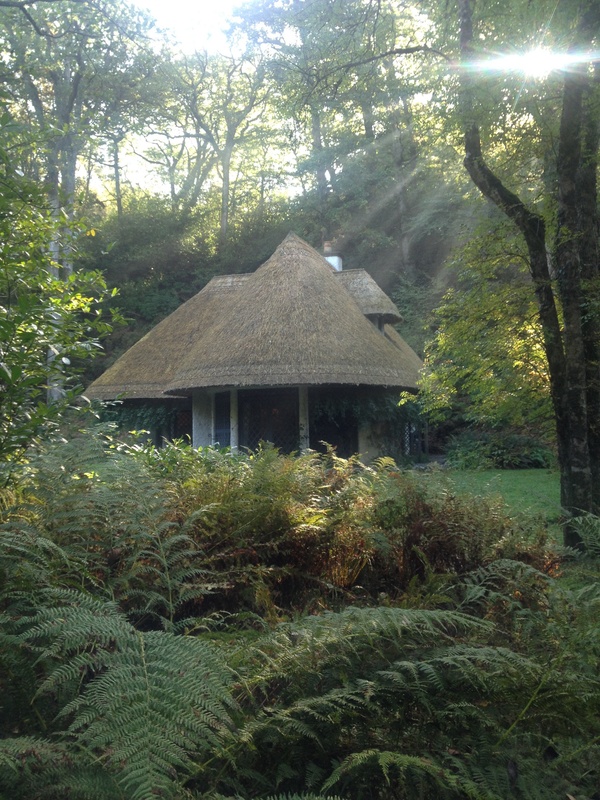 It will be apparent from the above that the Powers were an exceptionally enterprising family, and this is further demonstrated by the creation at Kilfane of a romantic private garden embodying the picturesque ideals of the period. 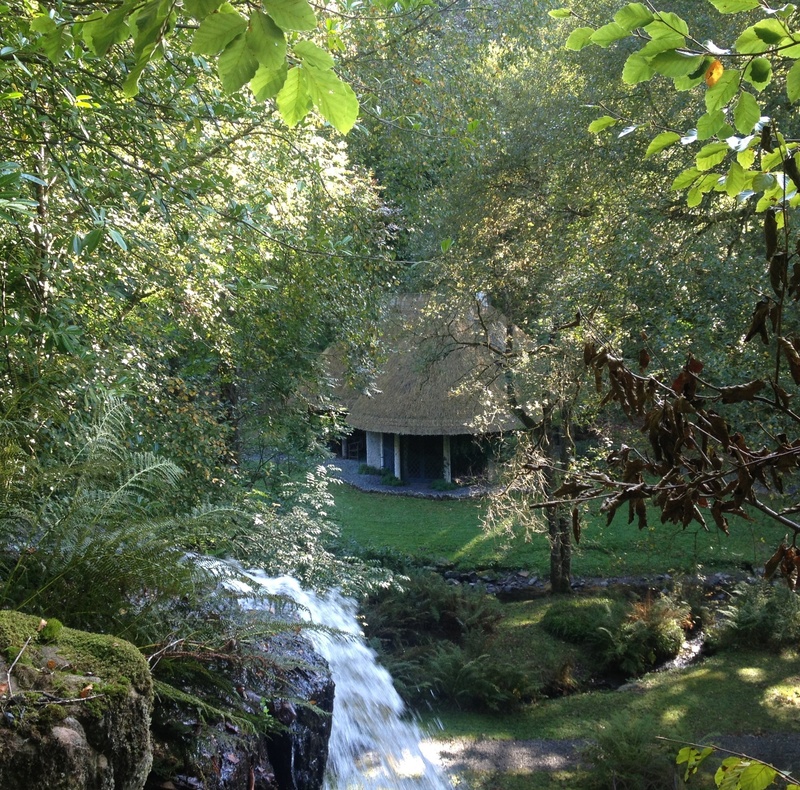 As is so often the case in Ireland, we do not know the precise date for the site’s creation or indeed who was responsible for its design (perhaps the Powers themselves, since the main house contained a famed library and they were likely to be familiar with the theories of Gilpin, along with those of other proponents of the picturesque such as Sir Uvedale Price and Richard Payne Knight). 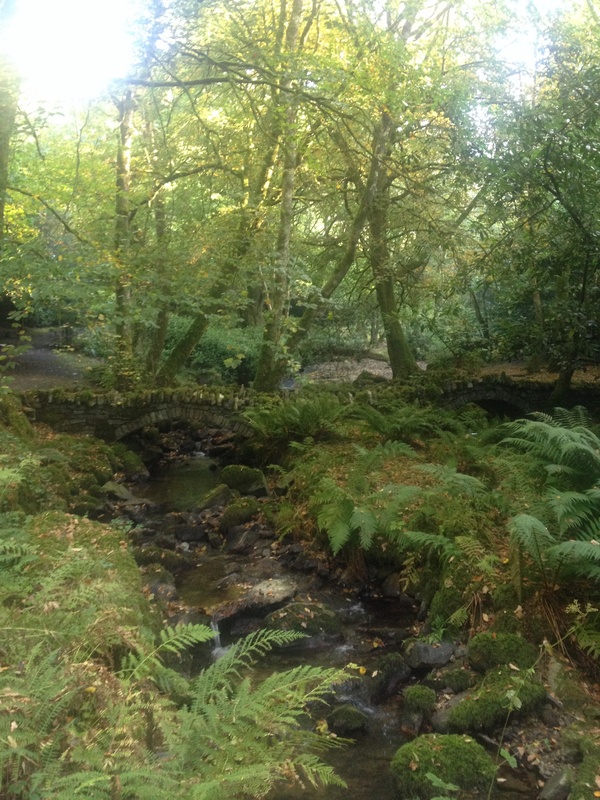 In any case, Kilfane possessed certain natural advantages: on the edge of the estate there existed an area of woodland where the land dropped away to reveal a rock face thirty feet high descending to an open vale dramatically strewn with boulders. Imbued with potential this spot was greatly enhanced by the Powers’ intervention, not least a waterfall which was fed by a mile-long canal specially created for the purpose. 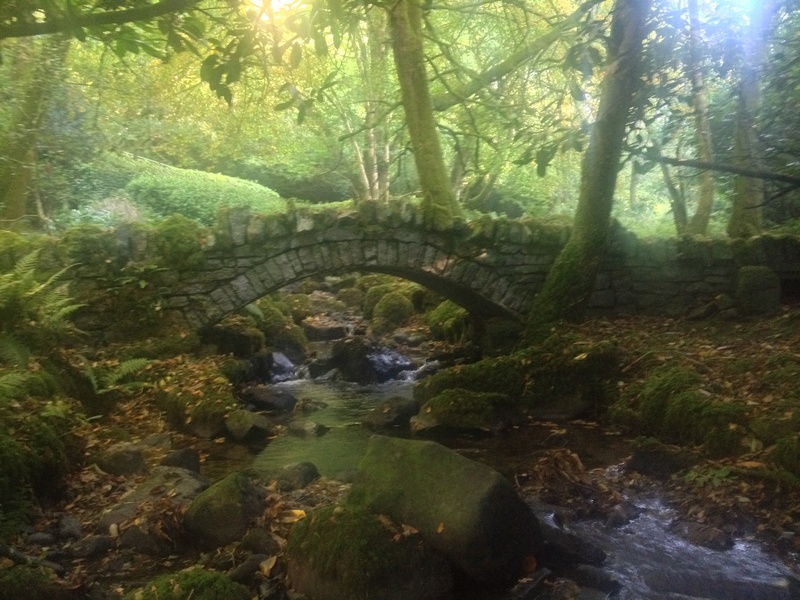 At the base of the cliff, the water drops into a pool before winding its way across a wide grassy lawn and from thence flowing along a stream that tumbles hither and thither beneath a dense blanket of trees and that can be crossed by a number of mossy stone bridges. 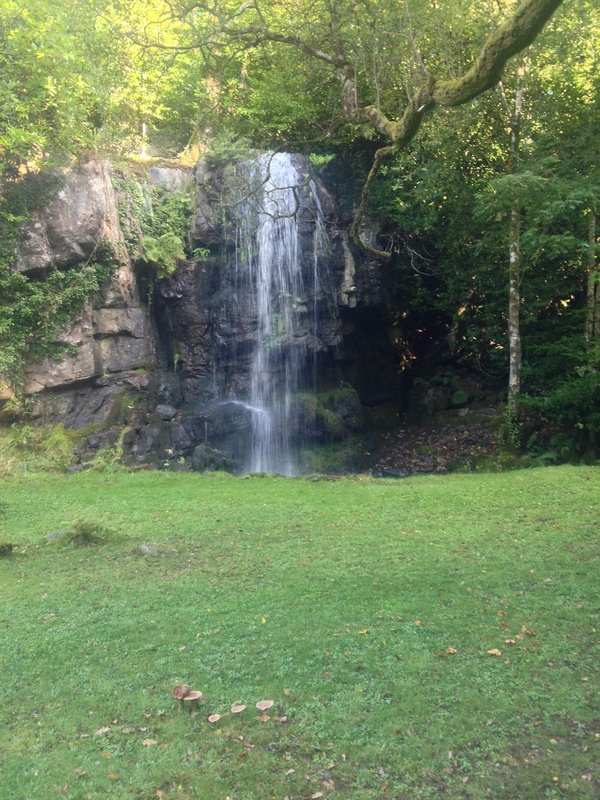 The effect is picturesque in the extreme, and was greatly enhanced within the natural amphitheatre at the base of the waterfall by the construction of a thatched cottage orné. The building was essential for the success of the enterprise, not just because it gave a focus to the scene, and a destination for visitors, but also because advocates of the picturesque argued that such landscapes needed a humanising focus in the same way as did the paintings which had inspired them. There had to be a central point to which the eye was drawn, in this instance a charming cottage which might be ‘discovered’ and explored. So it continued to look for some time thereafter, but later generations of the Power family lost interest in maintaining the site, or perhaps did not have the funds to do so. Gradually the whole place fell into decay, the cottage becoming a ruin, the grassy lawn and surrounding paths overgrown, the woodlands surrendered to laurel and rhododendron (with consequent loss of more delicate ground cover) and the waterfall dried up as the canal was breached and broken. Such might have remained the case to the present but for the discovery and rescue of this delightful spot by its present owners who more than twenty years ago embarked on a complete restoration of the place. Thanks to their admirable diligence the grounds today look much as they did when first created over two centuries ago. 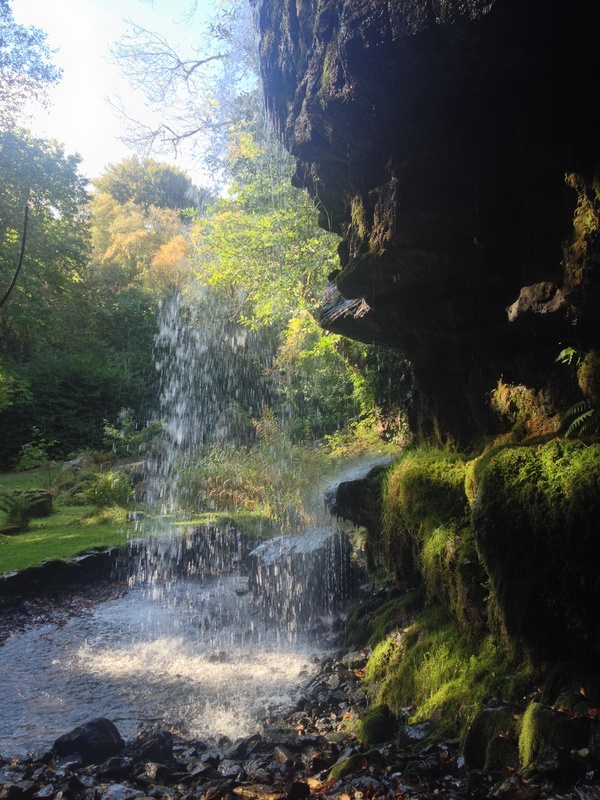 Reverting to Le Nôtre’s maxim – ‘To improve nature and reveal true beauty, at the lowest possible cost’ – one can see how applicable are those words to the glen and waterfall at Kilfane. Here is a landscape every bit as artificial as any designed by the Frenchman. In this instance, however, thanks to theories on the picturesque artifice has been concealed and nature encouraged to imitate art rather than the other way around. Separated by an outcrop of foliage, one carved stone fox serenades another with guitar. 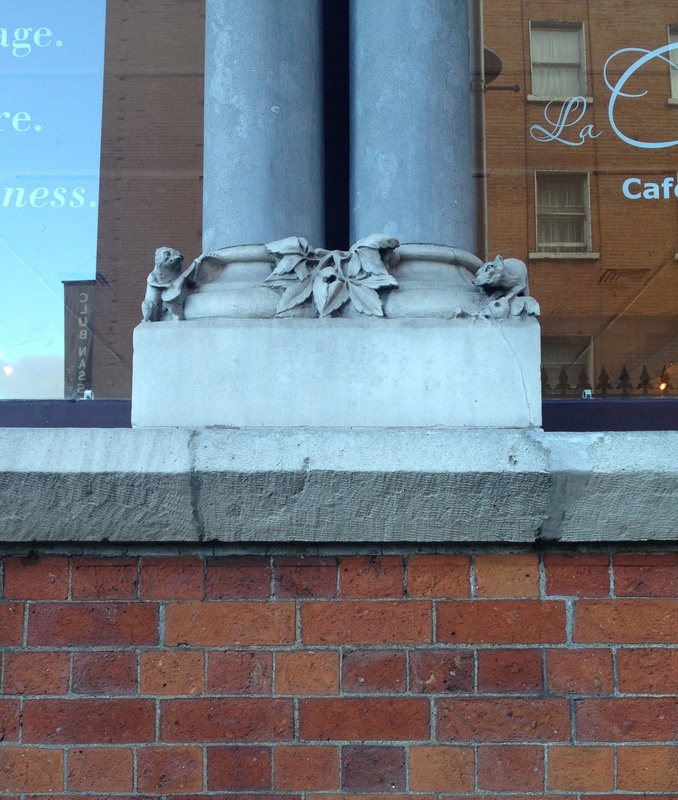 These figures can be found at the base of a pair of columns between two windows on the facade of the former Kildare Street Club, Dublin. Designed by Deane and Woodhead, this mid-19th century building had glorious high-Gothic interiors – not least a central staircase with first-floor arcaded gallery – which were ripped out in 1971 and replaced with a series of standardised office spaces. But at least the exterior remains unaltered, including the wealth of animals and birds such as this pair of would-be lovers.